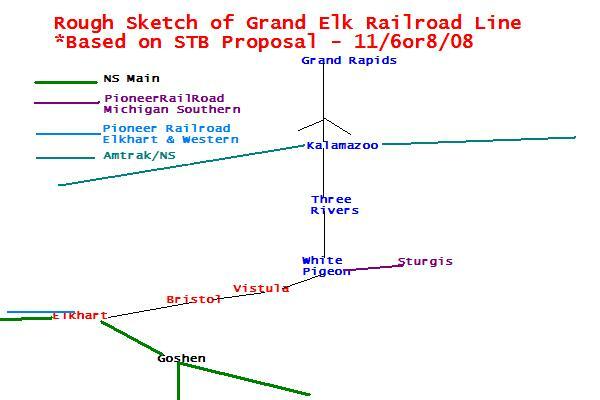 Click the Photo below to access more great Grand Elk Railroad Videos on Youtube! Welcome to the Railfan Page of the Grand Elk Railroad (GDLK) *(From Watco news). Below will be information and a forum for you railfans to discuss this new venture of Watco Companies and NS. *This page is for information/discussion by railfans of this new railroad. It is not affiliated with Watco/GDLK/NS. NEWS5/23: The Grand Elk Railroad officially started MARCH 7-8, 2009!!! (From a Watco Employee). LOCOMOTIVE ROSTER: SO FAR WAMX 3531(used on Locals), 3806,4002,4009,4020, 4121, 4124-4125(Used on K-Zoo to Elkhart Runs).